Descent of 5km without time limit! (from 1h to 1h30 non-stop, 2 to 3h recommended). 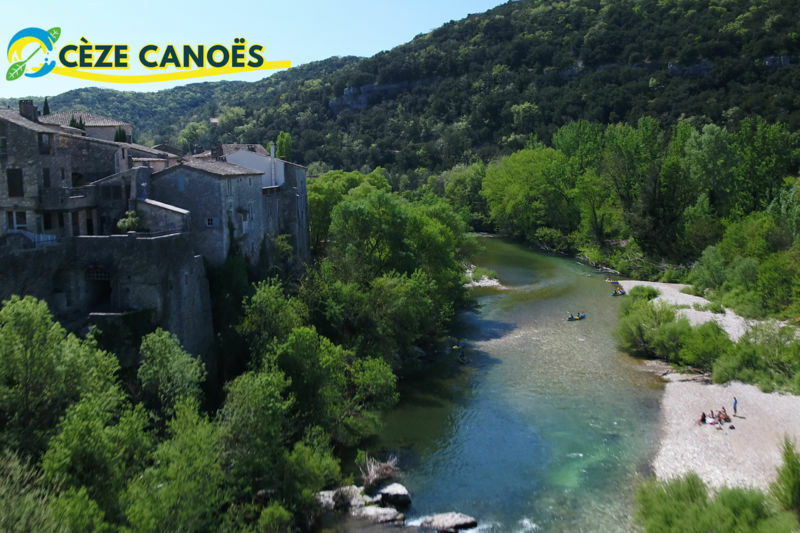 Learn about canoeing and stand-up paddling and experience a nature walk by choosing the short course of the Gorges de la Cèze. You will pass at the foot of the medieval village of Montclus and you can enjoy the calm of the Gorges to relax. Observation, calm, relaxation and sport are on the program! Opening period: Friday, May 31, 2019 - End of August: Meeting at the base of the Pont du Courau in Saint André-de-Roquepertuis. Bus departure every 30 min. Return at your convenience directly to your car. Low season: we adapt our departure times to the weather, thank you to contact us by email or phone. We welcome you and advise you on the choice of your course. On site, exchange booth and sanitary are at your disposal and a refreshment bar to restore you! Our shop : Neoprene shoe, eyeglass cord, waterproof phone protection and beach games etc. Free transportation by ours bus - free parking - free wifi. Sanitary : toilette, shower and booth to change. Means of payment : cash, credit card, ANCV holiday check, check.